We think of most movies as being the sum of their parts. The acting, writing, directing, and scenery all blend together to create the total film. Some factors may weigh more heavily than others, but it usually equals out in the end. But, in some situations, one factor dominates. In fact, it becomes the one reason to see the movie. If you've seen Kevin Hart in anything, then you know that he is a force of nature. He certainly puts forth this sort of authority in Ride Along 2, a movie which may as well have been called "Kevin Hart and some explosions". 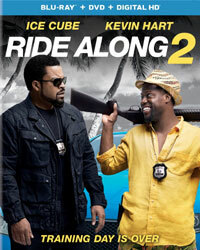 Ride Along 2 picks up not long after the events of the first film. There, we were introduced to Ben Barber (Kevin Hart), a goofy guy who somehow landed Angela Payton (Tika Sumpter) as his girlfriend. Ben was excited to learn that Angela's brother, James (Ice Cube), was a police detective and after a great deal of pleading, James agreed to take Ben for a "ride along", which ensued in all sorts of mayhem. As the second film opens, Ben has graduated from the police academy and he's now a beat cop, much to the chagrin of James. And, Ben and Angela are now engaged and are in the process of planning their wedding. Following an event-filled drug bust, James and Ben find a flashdrive, which has been encoded by AJ (Ken Jeong), a hacker with which Ben is familiar. James is given permission to go to Miami to apprehend AJ and he agrees to take Ben, assuming that his future brother-in-law will make so many mistakes that he'll be kicked off of the force. They arrive in Miami, where they meet local detective Maya (Olivia Munn). Ben and James soon learn that their simple task of grabbing AJ is just the beginning of a big conspiracy. Ride Along 2 harkens back to the buddy-cop movies of the 1980s like Beverly Hills Cop and 48 Hrs, as on the surface at least, it looks like an action movie. We get a bad guy, a vague story involving a major crime, a car chase, a gunfight, and explosions. However, the movie is really a comedy. And beyond all that, the movie is really Kevin Hart. The story here is incredibly flimsy, as it's simply an excuse to get Ben and James to Miami so that the fun can begin. The bad guy here is involved in some very non-descript "smuggling", as the movie couldn't be bothered to come up with anything more specific or elaborate than that. All of the characters which Ben and James meet are stereotypes and they are all there to serve some minor purpose and keep things moving along. The story is incredibly linear and nearly a twist can be found here. But, none of that is the least bit important, as Kevin Hart is in his element here. The outlook on Ride Along 2 is simple -- if you Hart amusing, then you will find something to like in this movie. The nice thing about what he delivers here is that it's not all low-brow and hysterical. Ben is an unusually sensitive man, which is probably one of the reasons why James hates him, and Hart place this part of the character perfectly. I won't give anything away, but his opinions on what should happen with the wedding, and his arguments with wedding planner, Cori (Sherri Shepherd) are hilarious. The same goes for the scenes in which Ben is called upon to exhibit his faux bravado. None of this is particularly original, but Hart brings a dynamic energy to the role and the clever nature of these jokes elevates this part of the film above the competition. Have you ever hit a fast-food place at just the right time, where the fries are just the way you like them or a burger has been put together with extra care? That's what Ride Along 2 is like. There's nothing original here and you've seen it many times before, but it's just enjoyable enough to make it feel that you weren't wasting your time. There are several laugh-out-loud moments, and the video game sequences helps to liven up what could have been another run of the mill action scene. Again, Kevin Hart steals the show, proving once again why this fast talking dynamo is so popular. Ride Along 2 should have made an Easter egg joke about the Jaguar on Blu-ray Disc courtesy of Universal Studios Home Entertainment. The film has been letterboxed at 2.35:1 and the Disc contains an AVC 1080p HD transfer which runs at an average of 34 Mbps. The image is very sharp and clear, showing no notable grain and no defects from the source materials. The film takes advantage of the colorful Miami atmosphere and the colors here look very good, and the image is never overly dark or bright. The level of detail is impressive, and the picture shows a nice amount of depth. The Disc carries a DTS-HD Master Audio 5.1 track which runs at 48 kHz and an average of 4.5 Mbps. The track delivers clear dialogue and sound effects. The nearly constant hip-hop music (all of which sounds the same) provides a good workout for the subwoofer. The stereo and surround sound effects really shine during the action sequences and we are treated to detailed, individual sounds from the rear at times. The Ride Along 2 Blu-ray Disc offers a slew of extra features. We begin with an AUDIO COMMENTARY from Director Tim Story. The Disc contains six DELETED SCENES which run about 9 minutes. There are a few funny moment here. This is followed by a 4-minute GAG REEL. "Ride Along With Us" (2 minutes) is a fake recruiting commercial featuring Hart and Cube, which is followed by "Behind the Scenes of Ride Along With Us" (1 minutes), which shows bloopers from the shoot. "The Ride Along Roundtable" (16 minutes) is an interview/discussion with Cube, Hart, Story and Producer Will Packer, who talk about the movie. (Ironically, they aren't sitting around a table.) "The Ride Diaries" (20 minutes) is a seven-part series of short on-set videos which take us behind-the-scenes to hear from those involved and see key scenes being shot. "Kevin & Cube: Brothers-In-Law" (7 minutes) is a fairly basic EPK which focuses on the dynamic of the movie and offers on-set footage and comments from the cast and the creative team. "The New Recruits" (6 minutes) highlights the involvement of Ken Jeong and Olivia Munn. Story explains the video game inspired scene in "Inside Black Hammer Vision" (3 minutes). "Ride Along with Kevin Hart" (5 minutes) follows the actor around the set. "Cori's Wedding Commercial" (2 minutes) is a fake commercial featuring Sherri Shepherd's character.